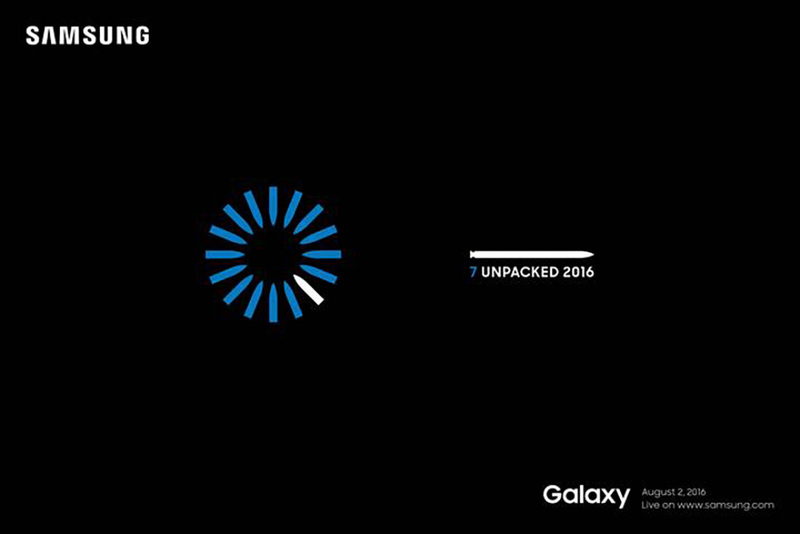 The rumors were spot in, as Samsung has announced this afternoon that they are hosting an Unpacked event at 11AM Eastern (8AM Pacific) on August 2nd to unveil “the latest in mobile innovation.” In case you haven’t been following along, that means that they will announce the Galaxy Note 7. As you can see from the teaser image that they sent to us in an invite, we are getting the confirmation on this being the Note 7 through the “7 UNPACKED 2016” with an S Pen sitting above it and the circle of pen tips with the 7th lit up. The event will be live-streamed, plus we’ll be on hand at a New York event to take it all in and bring you the hands-on experience. If you were at all considering a phone at the moment, you might want to consider holding off until August 2. First and foremost though, you might be curious as to why it’s called Galaxy Note7 instead of Galaxy Note6. There are a couple reasons why. First, the Galaxy Note7 will complement our Galaxy S7 and S7 edge, and unify our product portfolio. Second, the Galaxy Note7 will minimize confusion about the latest mobile technology from Samsung, and provide full alignment with Galaxy S smartphone. That’s sort of what we figured, a unifying of the portfolio and clearing up any confusion going forward.